Materials handling specialist Jungheinrich is set to release the ERC 215a Auto Pallet Mover (APM) later this year. According to the brand, the new machine will feature the latest generation of environmentally friendly three-phase A.C technology and can handle payloads of up to 1500kgs. The new model features a new driverless transport system, which is designed to carry out recurring transport assignments. In its standard version, the truck can handle lifting heights of up to 4000 millimetres, with higher heights available on special order. Head of APM at Jungheinrich Dr.Martin Schwaiger says the ERC 215a represents an inexpensive alternative for standard transport operations. "Intregrating an APM in the respective infrastructure is fast, easy and safe," Schwaiger says. 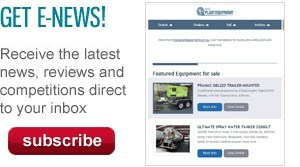 "Our modular system design offers great flexibility, making it easy to add further trucks." Jungheinrich adds the APM uses reflectors and laser navigation for precise warehouse orientation down to the millimetre. The ERC215a comes standard-equipped with a personnel safety system consisting of a laser scanner mounted in the direction of drive (load direction optional), plus built-in sensors in the load direction. "These essentially surround the APM with a protective field, which permanently checks the truck’s environment and stops the APM whenever an obstacle crops up," Schwaiger says. "Our driverless transport system is designed to cope perfectly with mixed operations." Both the vehicle control and route planning systems built into the machine ensure excellent coordination of vehicles and an optimised flow of traffic. The APM can be operated either as a stand-alone solution or in the context of a warehouse management system. Forklift sensors built into the ERC215a helps detect a broken pallet, generate an error message and cancel the job if need be. 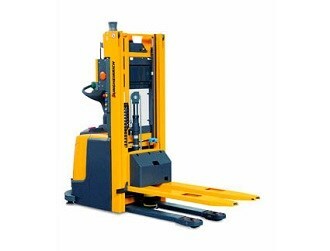 Jungheinrich is distributed in Australia by NTP Forklifts . Click here to find Jungheinrich equipment for sale. Click here to look up Jungheinrich equipment specifications.